UNITED NATIONS, Oct 4 2017 (IPS) - “Peace is not a one-day affair or event, it requires our collective effort,” said South Sudan’s Vice President, General Taban Deng Gai, while addressing the General Assembly at the UN. A mere two years after its split from Sudan, a country plagued by decades-long of ethnic-based civil war between Arab and non-Arab tribes, the independent state of South Sudan erupted in conflict when President Kiir, a Dinka, accused his then vice president, Riek Machar, a Nuer, of attempting a coup. Amid heightening political tensions, violent skirmishes flared up in the nation’s capital of Juba in mid-December 2013 between loyalist soldiers from both parties. South Sudan has been mired in conflict ever since – much to the dismay of its citizens who hadn’t imagined they would carry the torch of war into their new republic. Three months into a peace agreement signed by both parties in August 2015, the conflict reached a boiling point in December 2015 when President Kiir dissolved South Sudan’s 10 regional states and established 28 new states, resulting in a surge of violence beyond the capital, to several areas of the country. A transitional government formed by both parties in April 2016, with the peace agreement as a precursor, failed to temper the violence as clashes continued country-wide. Further, President Kiir’s appointment of General Gai, Machar’s political ally, as his new vice president inflamed Machar and his loyalists, resulting in a split within the opposition – thus fueling the conflict. A government ceasefire, declared after Machar fled the capital, crumbled shortly thereafter. With lengthy, arduous peace efforts failing and confidence in ending the conflict flailing, South Sudan is facing its gravest humanitarian situation in years. “This is the last chance of salvaging the peace agreement in South Sudan…we must resolve now, both individually and collectively, to do more to end this conflict,” said Ambassador Nikki Haley, the U.S. Permanent Representative to the UN, while addressing the UN Security Council last week. More than 2.5 million people have been displaced by the South Sudan conflict. An estimated 830,000 have fled to neighboring countries, mainly Ethiopia, Kenya, Sudan and Uganda, according to Oxfam America. Harassment and arbitrary detention of journalists, forced recruitment of child soldiers, widespread sexual violence and restricting movement of UN peacekeepers by both sides characterize the conflict in South Sudan, according to prominent human rights organizations like Human Rights Watch and Amnesty International. 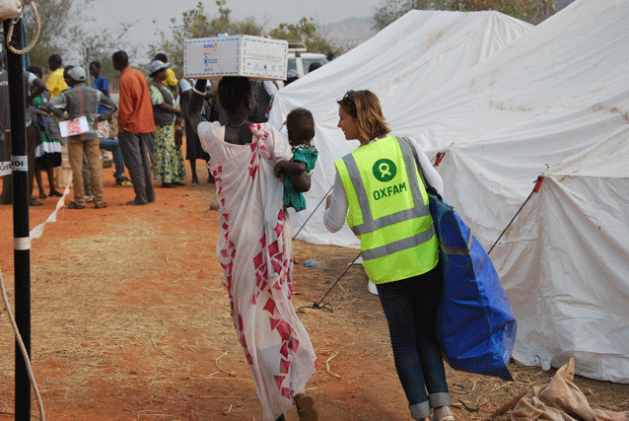 “In over 30 years working in South Sudan, Oxfam has never responded to such dire needs under such difficult conditions,” said Oxfam America’s president, Abby Maxman, speaking on South Sudan at the UN. The suffering of communities in South Sudan has reached unprecedented levels. “The situation is South Sudan is dire but not hopeless…when a situation is seen as hopeless and when the rhetoric surrounding it makes it seem ‘too complex’ and diminishes on-the-ground efforts, compassion fatigue arises,” said Gottschalk. Though it is the responsibility of the significant parties in South Sudan to root out the source of the problem, it is the duty of the international community to navigate a peaceful outcome for the sake of 12 million South Sudanese who have not given up. “We have not given up on them and we have not forgotten them…they have a friend and advocate in the US,” said Haley. The UN, African Union (AU) and Intergovernmental Authority on Development (IGAD) recently agreed to pool their efforts to support the revitalization of the political process in South Sudan. The primary goal in mind, for this joint communiqué, is to adequately represent all significant parties and encourage them to focus on the full implementation of the August 2015 Peace Agreement, under a permanent ceasefire. “This is the last chance at salvaging the peace agreement in South Sudan…the different parties to the conflict must use the next several weeks to commit themselves to this process and to conclude it,” said Haley. Before undertaking these well-intended collective measures, it is important to understand the nature of the conflict in South Sudan. “To get the country back on its feet, we must first recognize this conflict for what it is and what it isn’t…it’s not a tribal conflict, because ethnic identity doesn’t determine allegiance on the ground, it’s not a military conflict, because civilians, not soldiers, are bearing the brunt of the violence…in many ways it’s not even a political conflict, because that would imply that it’s about competing visions for governing this nation…what it is, is a hostage situation,” said Maxman. In July this year, the AU Commission, South Sudanese officials, and UN representatives met in Juba to discuss the establishment of an independent Hybrid Court for South Sudan, envisioned under the 2015 Peace Agreement, and agreed on plans to finalize the court’s statute by August, according to Human Rights Watch. Notably, South Sudan is not a member of the International Criminal Court (ICC). As such, its leaders can only be held accountable by the ICC through a request from the Sudanese government or a referral by the UN Security Council. Though a lack of accountability is a conflict-accelerant, a more immediate focus is required in the inclusive peace efforts geared towards helping the people in South Sudan. “It’s high time we throw our lot in with the hostages, not the hostage-takers,” said Maxman.